How Did Jeremy Clarkson End Up On The Floor Again? 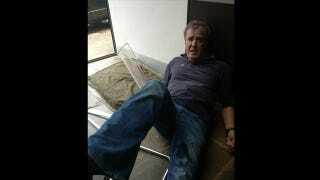 Another day, another picture of Jeremy Clarkson on the ground thanks to a broken chair. This time it appears his daughter Emily has included a more concrete explanation for how the Jezza ended up on the floor. How Did Jeremy Clarkson End Up On The Floor? The Daily Mail was right. He is fat. It's happened again. This is the Daily Mail article she's referencing. We still aren't positive if intoxication, weight or just a poor furniture decision are truly to blame for Clarkson's chair destruction, but we wouldn't be surprised to find out all three are somehow involved.